What makes a city great? Dynamic, people-centered spaces. 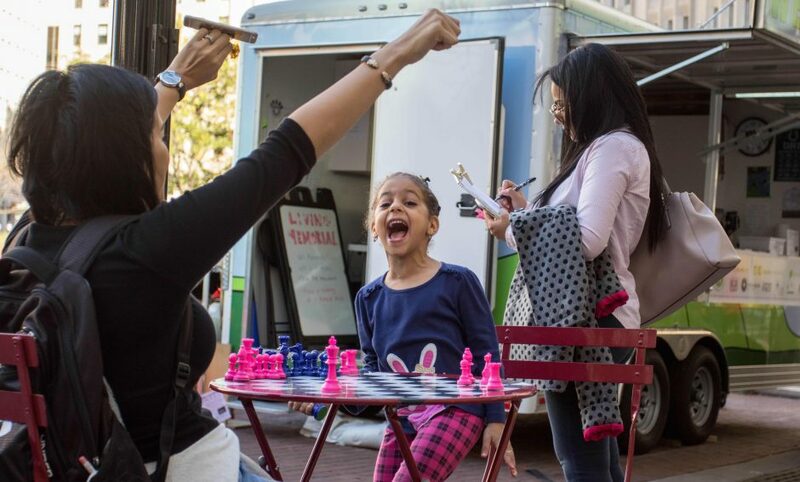 Aug. 1 through Oct. 16, 2015, Big Car and our partners staged a major placemaking project in Indianapolis’ most public plaza with new amenities and daily programming — Spark Monument Circle. Check out our Spark by the Numbers report. 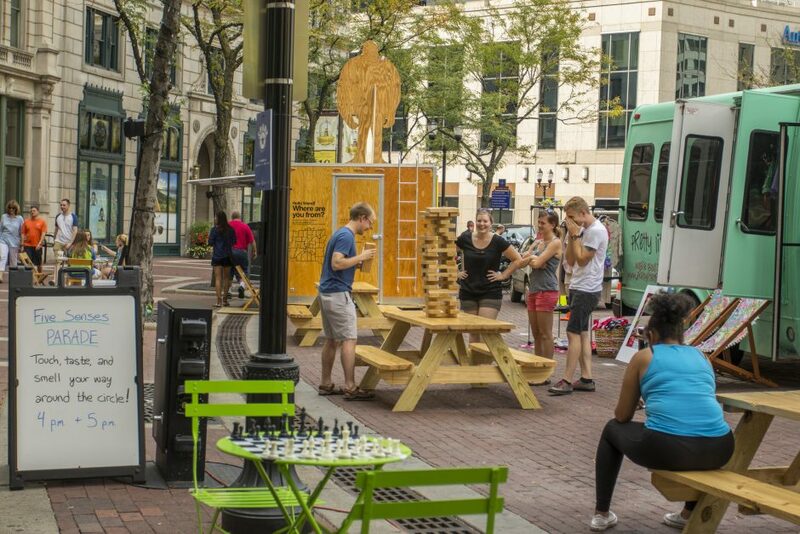 10 Things that happened at Spark: Monument Circle from Big Car on Vimeo. Browse photos from the project. Read the original press release here. 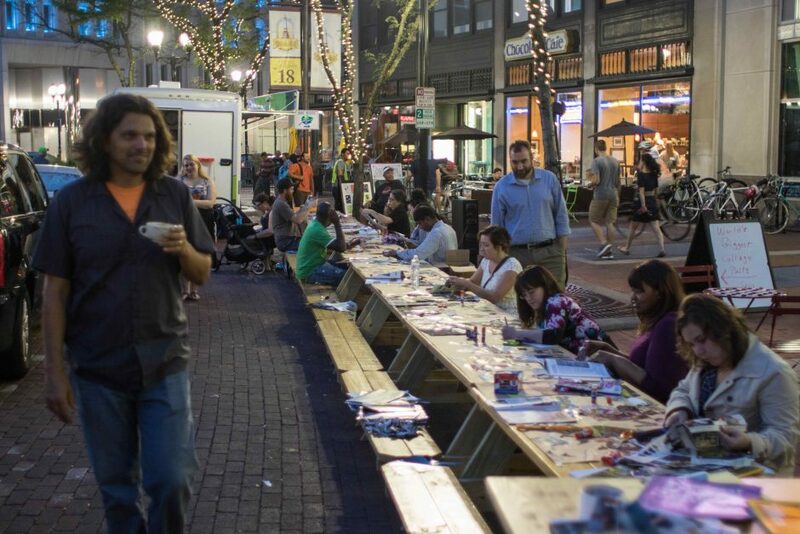 This temporary, demonstration was a partnership with The City of Indianapolis, funded by the National Endowment for the Arts and the Central Indiana Community Foundation. Our artist-led work activating the Circle included free, low-key programming and infrastructure: drop-in games, music, bistro-style seating on platforms known as parklets, conversation, the Wagon of Wonders, historical characters, fitness, and more, co-presented by a great roster of partners. The information gathered during Spark Monument Circle has been shared with the City of Indianapolis Monument Circle Reconstruction team for consideration in the longer-term re-construction project of the space. Provide an enjoyable, memorable, and surprising experience for visitors to Indianapolis. ✪ Throwback Thursdays focused on history – especially of Monument Circle – and bringing history to life with four characters: Gov. Oliver Morton, city planner Alexander Ralston, entrepreneur John Freeman, and First Lady Esther Ray Brown.